Baelfire is playing in the road. A man yells at him until he recognizes him. Rumpelstiltskin shows up and the man is frozen with fear. Rumpel realizes Bae’s leg is hurt. He transforms the man into a snail. Baelfire begs him not to but be crushes the snail. Later Bae comes home. He is still mad at his father over killing the man. He realizes Rumpel’s power is out of control and wants his father back the way he used to be. Rumpel wants to heal his leg with magic but Bae prefers medicine to magic. 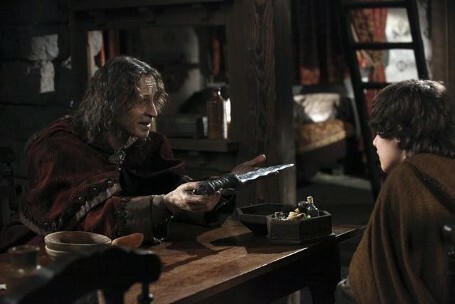 Rumpel shows him a dagger and explains that if someone were to kill him they would take the power and that is the only way to stop the magic. Bae is determined to find a way to get rid of the magic that doesn’t hurt either one of them. Outside Rumpel and Bae see two boys play fighting with swords. He encourages Bae to join in. He sits it out as the other kids are afraid of him. A girl comes by and tells Bae that to help his father he must seek out a magic stronger than his. When Rumpel returns we find out he just killed a mute woman because she knows what the dagger looks like. Later that night Bae summons the Blue Fairy. To save his father he must take him to a world without magic. She gives him the last magic bean she has. Rumpel sits weaving gold. Bae tells Rumpel of his meeting with the Blue Fairy and about the bean. At first Rumpel is reluctant and then he agrees. They go the forest where Bae drops the bean on the ground. A green portal opens. Bae wants to climb in but Rumpel is scared. He clutches Bae as Bae tries to pull him in with him. The last Rumpel hears of his son is his anger that Rumpel broke their deal. Bae goes in completely and the portal closes. Rumpel is stunned once he realizes his son is gone. He frantically claws at the ground crying how sorry he is and he should have followed him in. Rumpel summons the Blue Fairy. He demands a bean so he can find his son in the other world. He is livid when she tells him there are no more. They argue until he realizes that a curse can take him to the other world. He swats at the Blue Fairy and she escapes from him. August wakes up writhing in pain and falls out of bed. He makes his way to a phone and calls someone. He tells them they need to speed up the plan. He meets with Henry. They are still trying to figure out how to make Emma a believer. Henry and August also have another plan. Henry runs into Gold’s pawn shop. He asks for a suitable gift for Mary Margaret. As he works with Gold to find a gift August snoops around his office. Gold finds him and directs him to the main part of his shop. Emma goes to the hospital. Dr. Whale is tending to Kathryn but she is awake and coherent. She tells Emma she had been kidnapped and drugged. Whale chimes in that the hospital is investigating who tampered with the DNA evidence on the heart. I go to Gold’s shop. I express my anger. He had a deal with me. Kathryn should have been dead. As I get no where with him it dawns on me. He has been setting me up to get caught. I question as to why. He ominously tells me I should know why. Later David visits Kathryn. He apologizes. She graciously accepts. There are no bad feelings between them. A party is being thrown in honor of Mary’s return home. She is touched how many people showed up. At the party Henry presents her with a card and a gift as David arrives at the door. Mary sees him and motions to Emma to get rid of him. She does. Gold is spying on August and follows him around. He pays a visit to a nun and threatens to increase her rent if she doesn’t tell him what August wanted. She admits he is trying to reunite with his father. David waits outside to run into Mary. He apologizes. She tells him that she is still hurt that he did not believe in her. She feels like some dark force is always pulling them apart and still cannot do this. Gold goes to see Archie. This surprises Archie once he realizes Gold needs to talk. He finds out that Gold believes his son is around but may want to kill him. He confides in Archie he wronged his son. Archie encourages him to make amends and apologize. Gold goes to the woods and confronts August. He cries after August calls him Papa. He swears to August that he never stopped looking for him. The two have a tearful embrace. We believe Gold has found his son. They go to find the knife. Gold admits he buried it so I would never find it. In this world the knife doesn’t matter because there is no magic but they should destroy it. Once they find the knife August turns on him. He tries to use the knife to control him. Gold is furious and realizes this is not his son. Gold gets the knife back. He wants answers. He wants to know how August knows so much. He finds out August is dying and wanted him to use magic to cure him. Gold decides to let him live. I wait for Emma. Once she comes to her office I get Sidney to confess to everything. He tells Emma that he kidnapped Kathryn, stole my keys, and tampered with the DNA. She pulls me outside and tells me she doesn’t believe a word of it. The next part I didn’t see coming. Emma warns me that she plans to get Henry back.